Warm up the grill for our Marinated Grilled Chicken. Our Marinated Grilled Chicken utilizes the zest of KRAFT Sun Dried Tomato Vinaigrette Dressing. Pour dressing over chicken in shallow dish; turn to coat both sides of breasts. Refrigerate 5 min. Remove chicken from dressing; discard dressing. 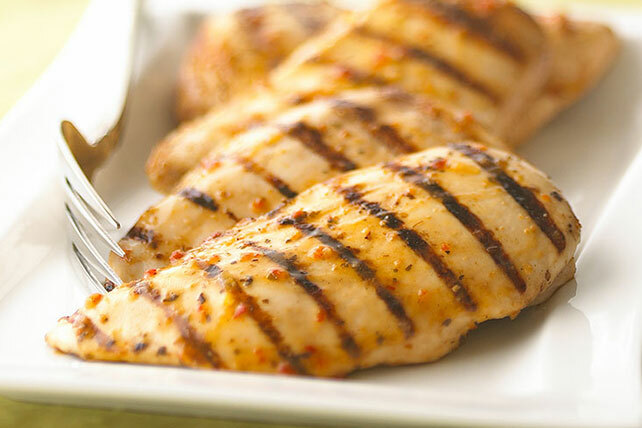 Grill chicken 5 to 7 min. on each side or until done (165°F). When grilling the chicken, set the timer in the kitchen for 5 min. on each side so you don't forget to turn the chicken. Don't overcook the chicken - grill just until the juices run clear. Grill runs out of gas unexpectedly or it starts to rain? That's easy. Just place the chicken on a baking sheet and bake in 400°F oven 20 min. or until done (165°F).